The Red-winged Blackbird tends to thrive in areas like wetlands and marshes. This is partly because it is where they find most of their food supply in abundance(seeds, insects, small aquatic life). These birds generally like to nest over and around the water so the tall grasses are a great covering for them from predators such as the hawk or eagles. Their nests are usually cup shaped and are made of grass and wetland plants held together by mud. These birds are located in huge numbers across the entire United States, Canada, and Mexico. Click here to view its range map and to hear the sound of the Red-winged Blackbirds song. Studies show that these birds tend to migrate short distances, but do not take part in a seasonal migration like some other birds do. 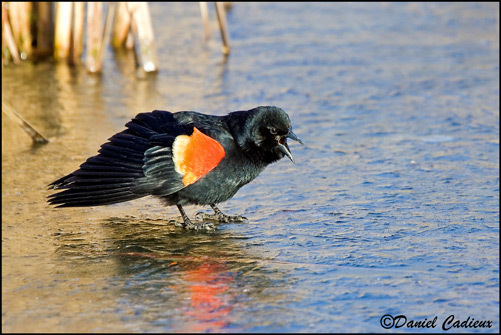 Click here to view a video of the Red-winged Blackbird. Keep flying through and learn about my dinner time!